This debut collection of stories by Michelle Sacks features characters from many walks of life, scattered around the globe—a young Irish woman backpacking in India, an ambitious black South African businessman, a roving killer for hire, a former SS officer. Their stories usually lead them—and us—to pivotal events that reveal unexpected, hidden truths. Working on a large canvas that encompasses the extremes of rural Africa and urban London, material poverty and the surfeit of privilege, Sacks writes stories peopled by characters whose lives occasionally crisscross, with a protagonist in one story playing a deceptively small role in another. The stories artfully illuminate the rich interconnections and clashes that occur as her characters strike out boldly, yet find themselves at the mercy of capricious waves of circumstance. 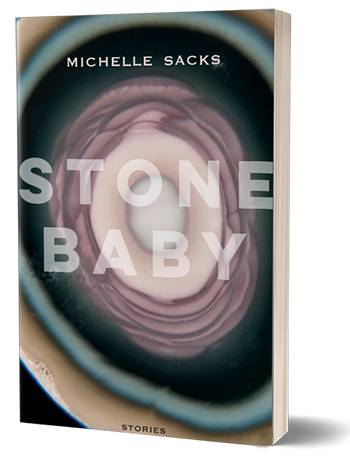 Stone Baby explores movement, loss, and reinvention in the lives of people who are in the wrong place, in the wrong body, perhaps in the wrong life—it encapsulates an engrossing and urgent message in our age of migration and dislocation. Order Stone Baby: Amazon | Barnes & Noble | IndieBound | Powell's | BAM! More information about Stone Baby is available from Northwestern University Press.